It is replaced by the Datalogic PowerScan 8300 Series. Extra long range, USB interface. Order cables and power supply separately. See accessories. 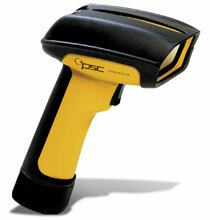 Industrial Handheld Barcode scanner (Standard Range, Keyboard wedge Interface, 8-0424-03 12 ft. PS/2 Cable). Discontinued and replaced by Scanner (Part# PD8330) and Cable (Part# CAB-436). Standard range, Keyboard wedge, RS-232 & wand emulation interfaces. Order cables separately. See accessories. See PSC PowerWedge for required decoder (for wand emulation operation). Long range, undecoded. Order cables & power supply/AC adapter separately. See accessories. See PSC PowerWedge for required decoder. Extra long range, Keyboard wedge, RS-232 & wand emulation interfaces. Order cables separately. See accessories. See PSC PowerWedge for required decoder (for wand emulation operation). Extra long range, undecoded. Order cables & power supply/AC adapter separately. See accessories. See PSC PowerWedge for required decoder. Standard range, USB interface. Order cables and power supply separately. See accessories. Standard range with USB interface and 12 ft. USB cable (Part# 8-0734-08). Standard range with USB and universal Keyboard wedge interfaces. Order cables separately, see accessories. Standard range with RS-232 interface. Includes RS-232 cable (Part# 8-0423-80) and US power supply. Standard range, undecoded. Order cables & power supply/AC adapter separately. See accessories. See PSC PowerWedge for required decoder. Long range, USB interface. Order cables and power supply separately. See accessories.